Champagne Marc Chauvet, Récoltant-Manipulant (RM). Winemaker Champagne since 1529. Nicolas, the mind of the grapevine. Clotilde, the mind of the wine. Brother and sister, Nicolas and Clotilde share the same passion for the grapevine and the wine. They use a double competence, Nicolas in the grapevines and Clotilde in wine production. Complimentary, they work together in the elaboration of the champagne Marc Chauvet, their father and founder of the brand. Real "creators of Champagne", the champenois winemakers have shaped, for generations, multifaceted champagne. They promote the expression of the terroir, with traditional, environmentally sound agricultural practices for the quality and the environment. Clotilde and Nicolas belong to this noble family of wine growers. Harvesters Récoltant Manipulant (RM), they have fully mastered their production, from the vine to the grape and the juice to the bottle. It is in the freshness of our hand dug cellars that time does his work. Quiet, dark and calmly fresh, they are home to thousands of bottles of Champagne Marc Chauvet, which slowly acquire their full maturity. Vaulted and carved in the chalk, they form a true Cathedral dedicated to champagne. No quality champagne without quality grapes. Nicolas watches attentively over his vineyard to produce the best grapes possible. Because the grapevine is alive, Nicolas does not over spray the vines, rather, he works with it, with a particular attention and manual maintenance, synonymous with hundreds of hours work per hectare. It is in this immaculate space, where light is reflected in the stainless steel of the vats that Clotilde works her wines and refines her blends. Temperature control, cooling system, high-powered aeration, pump system, everything to optimize the base wines and produce a champagne of high quality. The vineyards of Champagne Marc Chauvet are based in Rilly la Montagne, a pretty village located in the heart of the Montagne de Reims. Backed by the forest, classified as Premier Cru, it is one of the oldest wine-producing villages Champenois. With its 1080 inhabitants, it extends 851 hectares, of which 312 hectares are intended for the cultivation of the vine. The flagship of our range, our cuvée " SPECIAL CLUB ", Treasure of Champagne, is produced only during exceptional years, in restricted quantities and respecting the chart of the “ Club Treasure of the Champagne region ”. It is the most ancient and most successful of our cuvées, fruit of an assemblage of our best plots, maturing with a slow ageing (between 7 and 9 years), in constant temperature and sheltered in our Champagne cellars. 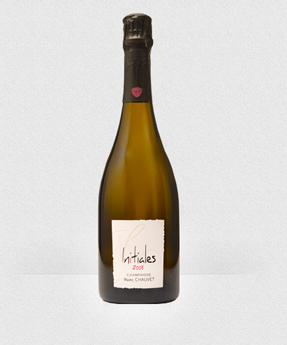 The champagne Marc Chauvet received medals at the Vinalies Internationales 2011 and 2012 competition.